We got you covered with your southern Utah boat rental needs. When you rent our boat you have the freedom to take it where ever you want. 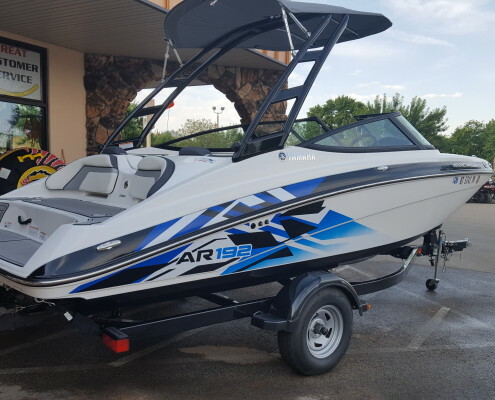 You get a newer well-maintained boat that seats eight people and can tow a wake board, tube, or any other water toy. Our boat comes with a radio/CD player, shade top, and easy to use trailer. During rental checkout we will go over operation and make sure you are comfortable with operating the boat. There are also important details about boating laws that should be known. We will make sure you understand those laws if you have any questions. The jet skis newer, nice, well maintained units that seat three people or two people with a wake board, tube, or other water toy behind. During checkout we will go over all of the same topics as when renting the boat and will ensure you know what you need to know to have fun and stay safe. You can take the boat or jet skis yourself, as they come loaded on a trailer and ready to go, or you can have them delivered for a fee. There are two local reservoirs to take the watercraft. The most popular local spot is Sand Hollow State Park, with its sandy beaches and great views it is a great place to enjoy the water. There is also Quail Creek State Park which offers great views and excellent fishing. 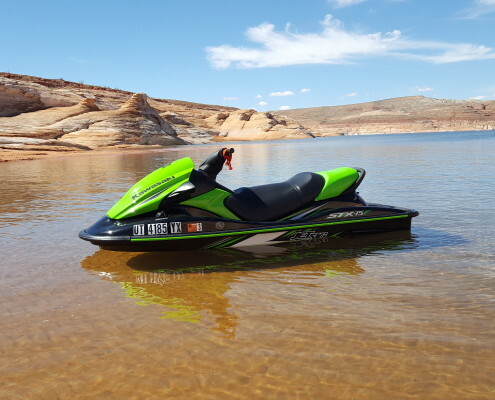 Again, we allow you to take our watercraft wherever you want, meaning you can use the boat or jet skis for Lake Powell and Lake Mead trips. Remember we also offer a multi-day discount too! Price match! If you find a lower price from a competitor give us a chance to meet or beat their price.